Congratulations to our December Certificate of the Month Winner, Lexi Simons from FamilyWorks Together! This holiday season there is perhaps no better organization to highlight for this month’s award winner. FamilyWorks Together provides comprehensive education and training opportunities to families formed through adoption, kinship and guardianship. FamilyWorks Together offers trauma-informed, adoption-competent and attachment-sensitive counseling to individuals, families, and groups in a number of settings. They strive to teach and prepare parents and their unique children for the journey of family together and endeavor to assist those involved in the child welfare system, or at risk for such involvement. 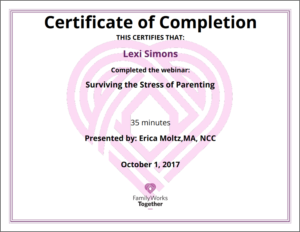 Lexi’s certificate resonated with us because it reinforces both the logo for FamilyWorks Together, as well as the overall mission of the organization – this is an organization that cares, and has heart. It is truly our privilege and honor to support the important work that FamilyWorks Together does, in our own very small way. Lexi and team, thank you for what you do! You are a fantastic example of the true meaning of the holiday season.